The maker of a popular app has branded it with a new TLD. 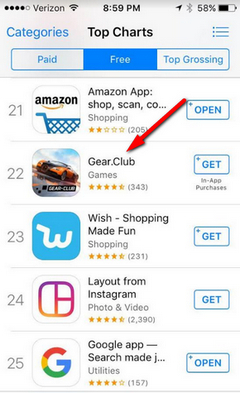 I was scrolling through the iTunes app store charts last night when something caught my eye: an app called Gear.club. My first thought: A case of weird branding, or does this company actually own gear.club? It’s the latter. The app maker bought gear.club as a registry premium in February for $5,691.66 and has branded its app to match the domain name. The logo for gear.club shows a dot midway vertically between R and C, but the branding on its site calls it “Gear.Club”. It looks like a pretty spiffy car racing game. Yesterday it was #10 on the iPad free list and, as you can see in the image, #22 on the iPhone free list. This is the first time I’ve seen a new top level domain name as the name of an app in the iTunes app store. Come to think of it, it’s the first time I’ve seen a domain name used this way. The post .Club domain name in the iTunes app store appeared first on Domain Name Wire | Domain Name News & Views.